Adventure Cycling: a nonprofit organization whose mission is to inspire and empower people to travel by bicycle. Established in 1973 as Bikecentennial, Adventure Cycling is the premier bicycle-travel organization in North America with more than 35 years of experience and 48,000 members. Bitterroot Backcountry Cyclists: a group that has been helping the USFS keep hundreds of miles of trails in the Bitterroot open and accessible for all users for many years. Ladies Fancy Ride: A group for female cyclists in Missoula to promote community through fun and fancy bicycle rides. 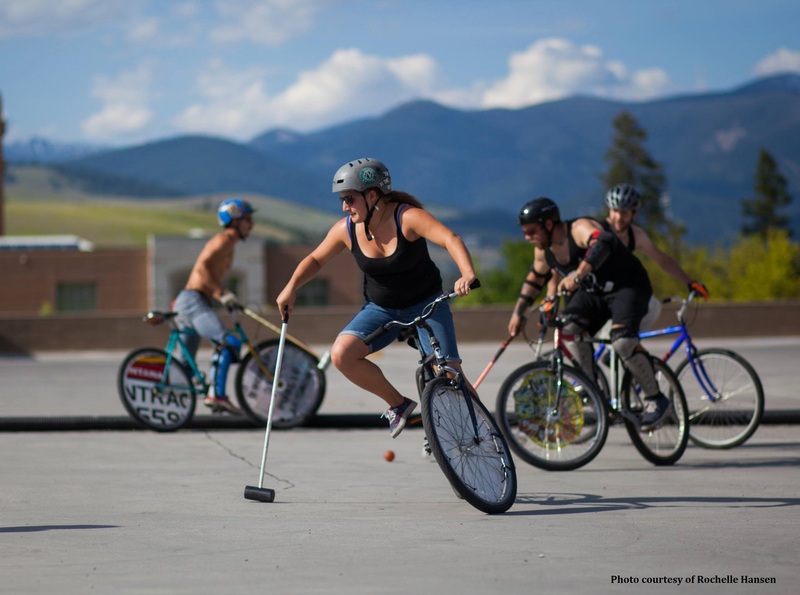 Missoula Bike Polo: Hardcourt Bike Polo in Missoula! Every Sunday, 7pm University of Montana Parking Garage, floor 2 or 3 weather dependent. Free fun for all! Missoula Cyclocross: All ability levels encouraged, mountain bikes welcome! Missoulians on Bicycles (MOBI): a nonprofit organization established to promote cycling in western Montana. Montana Dirt Girls: A group of women in the Missoula area who get together once a week to hike & bike! Mountain Biking (MTB) Missoula: supports local or visiting mountain bikers find the very best of everything related to mountain biking in one of the most pristine mountain biking counties in the Northwest. MT Alpha Cycling: MT Alpha is an organization committed to bike awareness, women in the sport of mountain biking racing, and community outreach. Regardless of your skill level, MT Alpha offers a haven for women to support each other and feel confident in a typically male dominated sport. RATPOD (Ride Around the Pioneers in One Day): An annual ride for charity starting and ending in Dylan, MT. Bicyclists ride 130 miles around the Pioneer Mountains to raise money for Camp Mak-a-Dream - a cost-free, medical camp in Western Montana serving children, teens, young adults and families affected by cancer. UM Cycling Team: road racing in the Spring and cyclocross in the Fall. Interested in joining? Contact them by emailing cycling.um@gmail.com. UM Mountain Bike Club: Students who love to mountain bike welcome! Women Bike Missoula (MizzBs): brings women together to make bicycling possible for more women and girls by sharing our knowledge, experiences, and the joy and benefits of bicycling. Bicycle/Pedestrian Advisory Board: responsible for being a citizen voice to the City of Missoula regarding getting around by bicycle and on foot. This can include consideration of bicycle and pedestrian facilities, policies and behaviors. Bike/Walk Alliance for Missoula (BWAM): a non-profit, member-driven organization created to improve the safety, health and enjoyment of the Five Valley area by promoting and enhancing bicycling and walking for everyday transportation and recreation. Bike Walk Montana: Mission is to make biking and walking safe and accessible for all. Missoula Bike/Ped Office: This office's mission is to reduce single-occupant motorized vehicle use and enhance non-motorized transportation options. Missoula In Motion: to increase the use of sustainable transportation through a connected transportation network that is safe, accessible, affordable and desirable for all Missoulians and contributes to a cleaner environment, healthier individuals and a more vibrant place to live, work and play. MIM is a program of the Transportation Division of the City of Missoula. Missoula Institute for Sustainable Transportation: a citizen-based non-profit organization that works to create a sustainable transportation system in Missoula that can be an example for other similar communities. They have goals for safety, equity and environmental soundness. Coaster Pedicab: Pedicab manufacturing company based in Bonner, MT. ThirstGear: A local business that allows you to rent and ride a 15-passenger bicycle to local breweries. You must be 21 or older to ride.